A video of JYJ’s Park Yoochun showing a warm relationship with a child star has become a hot topic among the netizens. The video showed Yoochun together with Kim Yoobin, who had played the role of Choi Siwon’s daughter in the SBS drama “Oh My Lady,” interacting in a warm manner in the waiting room. After watching the video, netizens have expressed that “There is a 99.9% chance that Yoochun will be a DdalBabo,” “I’m so jealous of the child,” “they look really happy together,” and other thoughts. On another note, Yoochun is currently in the midst of filming for the MBC drama “Ripley,” which will be aired in May. MBC’s new drama that will air on Mondays and Tuesdays, starring Park Yoochun and Lee Dahae, is now officially named Ripley. A great deal of attention has been placed on Ripley due to its cast, which includes Park Yoochun, Lee Dahae, Kang Hyejung and Kim Seungwoo. The drama revolves around a white lie that led to more lies and ultimately left the protagonist with nothing in the end. With JYJ’s Junsu confirmed for the line-up of 2011’s “Mozart!“, a new poster featuring all four actors playing the role of Mozart has been unveiled! Posing alongside Junsu are actors Im Tae Kyung, Park Eun Tae, and Jun Dong Suk, each expressing a different emotion. 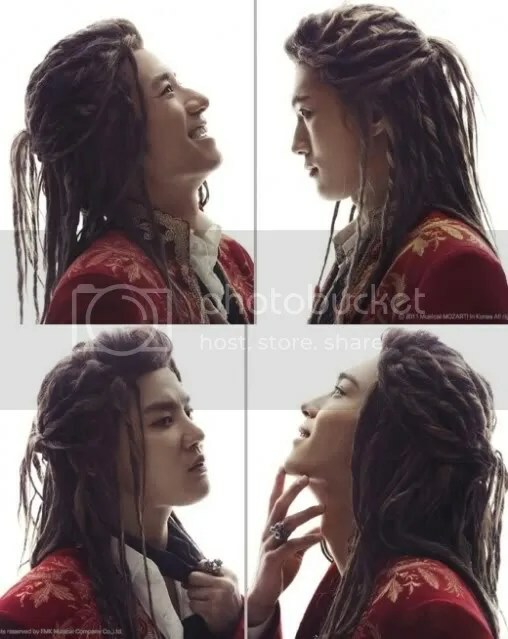 Since their individual personalities are quite unique, fans are already anticipating the subtle differences they’ll bring to their portrayal of Mozart’s character. The musical first kicked off its Korean performances in 2010 at the Sejong Center for the Performing Arts. The 3,000 seat theater managed to bring in a 100,000 member audience within a month. ”Mozart!” also came away with 11 trophies at various musical awards for the year. “Mozart!” will begin once more at the Sungnam Art center from May 24th through July 3rd. [TRANS] 110414 FROM PARK YOOCHUN TO G-DRAGON – WHICH IDOL HAS THE BEST OFFSCREEN STYLE? Idols’ every movement create massive ripples in their fans’ lives. Not only on the stage, even in their daily lives, the idols’ every move is the centre of everyone’s attention. The stars’ personal style, wearing clothes that they own and wasn’t styled by their stylists is what garners the most attention these days. From this, fans are able to see how their idols are influenced by the current fashion trends and how they interpret it – bringing both eye candy and envy to the fans. For a lot of idol groups, wearing everyday clothes still couldn’t diminish their ‘star style,’ and even with just a t-shirt, they are able to radiant their individuality. The bright eyes on his petite face, with skin that is softer than women, and shoulders that are as wide as the Pacific Ocean – using unrealistic proportions and exaggerated facial features to describe the very sought-after Park Yoochun. Being able to wear the open collar sweater and UGG boots that most men avoid, Yoochun shows that he can wear whatever he desires while still maintaining his own style and chicness. Especially in the recently released production photos of MBC’S “Miss Ripley,” displaying his perfectly straight shoulders in a suit. This attracted comments such as “Unrealistic perfection” and “Perfect on screen boyfriend” from female fans – Yoochun can pride himself in knowing that he is one of the most fashionable star both on and off screen. 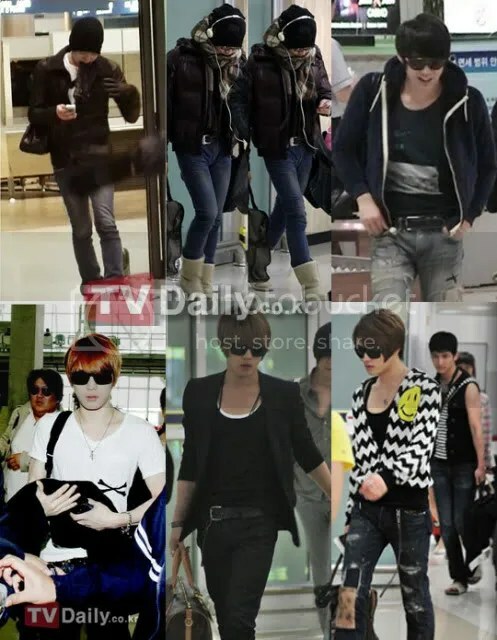 In the same group as Park Yoochun, JYJ’s Kim Jaejoong has impeccable fashion taste as well. No matter what he’s wearing, it still seems like he just walked out from a poster shoot. Especially the smiley face hoodie, deep V-neck t-shirt and other uniquely styled items that Jaejoong wore – he is always bound to be highly praised. 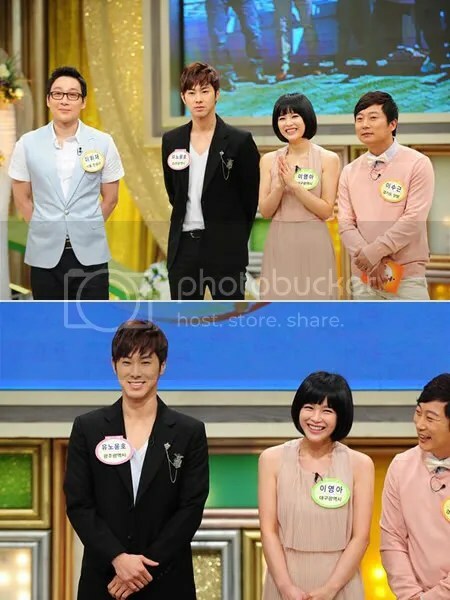 [TRANS] 110414 U-KNOW YUNHO’S YOUNGER SISTER MAKES A SURPRISE TV APPEARANCE! The younger sister of U-Know Yunho, a well-known beauty of Gwangju, has appeared on TV for the first time. SBS’ ‘DalGoNa’ (A Sweet Hometown Outing) was recently given a time slot and the recording of the first episode was completed successfully with Lee Hwijae and Lee Soo Geun as the two leading MCs. ‘DalGoNa’ is a variety program where stars take on challenges to thank their hometown schools and friends and present theses precious contacts with gifts. In order to accommodate to celebrities’ busy schedules, the program uses a widescreen LED display to hold a live video chat between Seoul and the celebrities’ hometowns. TVXQ’s U-Know Yunho and actress Lee Young Ah appeared on the first episode of ‘Dalgona’ as guests. Lee Young Ah, who appears as a special guest on the first episode, will step up to the plate as an MC alongside Lee Hwijae and Lee Soo Geun on the second. U-Know Yunho’s younger sister made her first appearance on TV during this episode. Many people from Gwangju, such as U-Know Yunho’s paternal first cousin once removed and his wife, grandmother, cousin, aunt, friends and teachers, gathered to support him. For Daegu-born Lee Young Ah, her father, younger brother, aunts and cousin made appeared on the screen. The episode brought together the stars’ families and the celebrities emotionally shared their honest family stories. The first episode of ‘DalGoNa’, a hot topic due to the first TV appearance of U-Know Yunho’s sister, will be aired on April 22nd. I’m sure everyone has found out by now, but it seems that Super Arena has revoked their permission for the charity event. But we have received explanations from Zak that they are now still carrying out negotiations…..Does that mean that there is still a chance? The goal of this was to raise money for the victims, so why can’t they sing? Not allowing raising of donations, isn’t this an act of being anti society? Why is it that the problems between adults become priority over saving the victims? Or does that mean that it would be okay to just stand in front of everyone without singing? Somehow, I want them to keep trying!! 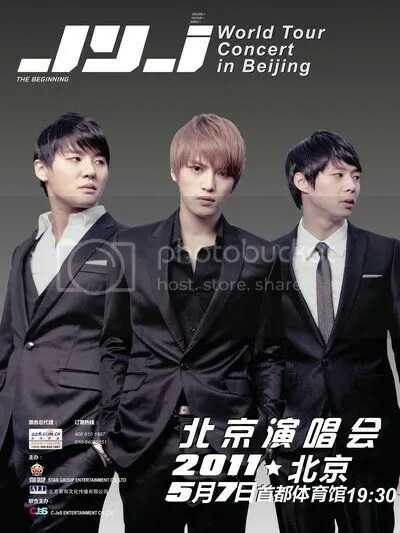 The show that the Chinese fans have been waiting for, the “JYJ World Tour Concert in 2011″ has finally come to Beijing. Hailed as a “Creative Challenge”, the World Tour Concert was executed perfectly in Thailand on 2 & 3 April, and this exciting feast of sight and sound will be brought to Beijing on 7 May. As there will be no extension of the stage, but wanting to ensure that all fans will be able to enjoy the exciting performance, Director Kim Jaejoong has been in discussions with the technical staff that had visited the location beforehand, to make the appropriate changes based on the specifications of Capital Indoor Stadium. Also, to ensure that fans sitting at the balcony seats will be able to get a clear view of the three members, additional high-definition projectors will be added to both sides of the stage, as well as a LED screen measuring over 200 square meters to be placed at the centerstage. There will be a total of 9 lifts on the stage, and no expense has been spared for lighting, movable screens and other special effects equipment, for the sake of creating the best visual effects and presenting an unbeatable audio-visual experience. As the overall director for the World Tour, Kim Jaejoong will be headed to Beijing earlier to participate in the entire stage production. They will also be trying their best to include Chinese elements, making this remarkable stage one to look out for. The organizer expressed that there had been no plans made for a concert in China during the initial announcement of this first JYJ World Tour, but they quickly contacted the Korean management and after much effort managed to secure this one an only concert (in China.) The members of JYJ are also looking forward to this trip to China, and have expressed that they will present a most exciting stage for their Chinese fans, so that every attending fan will be able to bring home an unforgettable memory.